October 19, 2018—Responding to a call for help from hospital CEOs in his home state and across the country, U.S. Senate Minority Leader Chuck Schumer (D-N.Y.) has urged Trump administration health officials to reverse a nearly 30 percent cut in Medicare Part B drug reimbursement to hospitals in the 340B drug pricing program. “That’s why today I’m calling on HHS and CMS to reverse these cuts at once, to protect access to essential health care services for communities across Upstate New York,” Schumer said. Earlier this month, CEOs representing more than 700 hospitals and health systems in the 340B program wrote to Schumer, Senate Majority Leader Mitch McConnell (R-Ky.), House Speaker Paul Ryan (R-Wis.), and House Minority Leader Nancy Pelosi (D-Calif.) urging Congress to protect the program from “recent regulatory actions that have reduced the reach of this vital program and by legislative proposals that would undo more than two decades of bipartisan work to preserve the health care safety net.” Of that total, 26 of the hospitals were from New York state. “We applaud Senator Schumer’s bold stance to protect the safety-net hospitals of his state and of the nation,” said 340B Health Interim President and Chief Executive Officer Maureen Testoni. “These cuts are already harming hospitals’ ability to serve patients in need and must be stopped.” 340B Health organized the drive to collect CEO signatures for the letter. Schumer said the Empire State’s 340B hospitals stand to lose $1.7 billion over the next decade because of the Medicare cuts. 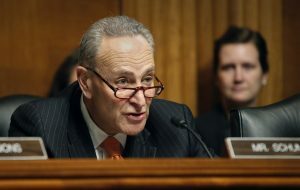 At Strong Memorial Hospital in Rochester, N.Y., and other hospitals in the UR Medicine health system, the Medicare cuts are placing regional cancer care, substance abuse treatment, mental health services, charity care, and free medications for patients who cannot afford them at risk, Schumer said. The cuts also threaten the ability of United Memorial Medical Center in Batavia, N.Y., to provide medical oncology treatments to patients in need and expand access to pharmaceuticals and more comprehensive services. Noyes Memorial Hospital in Dansville, N.Y., may have to curtail its mental health services if the cuts are not reversed. The opioid crisis has added to the demand for these services, hospitals officials say. New York state hospital representatives seconded Schumer’s estimation of the 340B program’s importance. Despite calls from hospitals and others to stop the cuts, CMS has proposed continuing them in 2019 and applying them to more providers. CMS will soon announce if it going to move forward with that plan when it publishes final rules for next year.